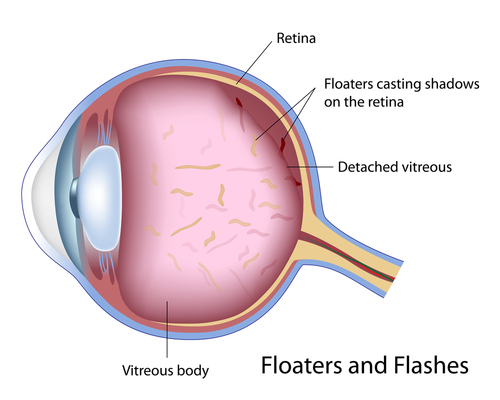 Vitreous Floaters - What Are Eye Floaters? Vitreous floaters become more common as we age, but they can also be a sign of a more serious eye condition. Those annoying little specks that look like small cobwebs or squiggly lines that float across our field of vision come in many different shapes and are more noticeable when looking at a white piece of paper or a blue sky. The shapes are actually the shadows of small pieces of debris. You may be wondering if vitreous floaters are harmless or a sign of a serious eye condition. This was our concern as well when my husband had a sudden increase in the numbers of floaters as well as some flashes of light. The vitreous humor is a clear gel-like substance that is composed mostly of water and gives the eye its shape and form. It fills the space between the lens and the retina (80% of the volume of the eyeball) which lines the back of the eye and helps to keep the retina in place by pressing it against the choroid, a layer of the retina made up of blood vessels. There are millions of fine fibers in the vitreous. These fibers attach to the surface of the retina. Floaters in the eye can be a natural occurrence as people get older and are the result of age related changes in the vitreous humor. As it shrinks, these fibers that are attached to the retina pull away from the retinal surface and separate from the retina. This can cause vitreous floaters. The aqueous humor, the fluid in the front part of the eye, is continuously replenished. However, the gel in the vitreous body is not. Therefore, if debris from these tiny breaks in the retina get into the vitreous humor, these floaters will remain there. This debris or tiny specks of tissue are called vitreous floaters. They may look like dots, dust, cob webs or strings in your vision. You are actually seeing the shadow of this debris as light is cast onto your retina. These specks move when you move your eyes and dart about in the vitreous gel, but eventually settle to the bottom of the vitreous cavity out of your field of vision. They can be annoying and interfere with your reading. However, most ophthalmologists consider them harmless and a normal sign of aging. However, when there is a sudden increase in the number of floaters, contact your eye doctor right away as it can be a sign of a more serious retinal problem, like a retinal tear or detachment. Over 50% of people over the age of 70 experience floaters. Floaters become more frequent as a person ages. Floaters can occur just in one eye or both eyes. If you notice a sudden change in the type or number of spots or flashes, see your eye doctor. That's what my husband did, and after a visit to the ophthalmologist and then with a retina specialist, it was determined that indeed his floaters were not the result of any retinal detachment and no treatment was needed. There are several causes of eye floaters, but the most common one is a posterior vitreous detachment. My husband has been to the ophthalmologist twice in 12 months because of a rather sudden increase in the number of floaters. The day before this sudden increase he had been using a jack hammer to take out some bathroom tile which also meant he was working in a room full of fine dust and debris. As a person ages, the vitreous gel starts to liquify which causes the volume of the gel to shrink. When the vitreous gel shrinks sometimes the fibers pull at the lining of the retina causing a post vitreal detachment (PVD). A sudden increase in the number of floaters is a symptom of a posterior vitreous detachment. If a person has a PVD in one eye they are at a higher risk of having one in the other eye. This was true for my husband. 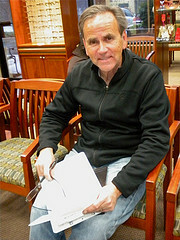 He had a PVD in his left eye and a year later another one in his right eye. When the vitreous gel shrinks, if the tugging or pulling on the retina is more sudden rather than gradual, a retina tear can develop. 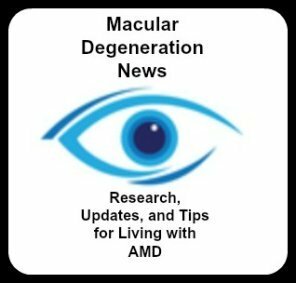 When my husband was examined by a general ophthalmologist for his PVD she was not certain that there wasn't a slight retinal tear and referred my husband to a retina doctor. If fluid gets in the tear or hole it can build up behind the retina and lift it up. When this happens the retina detaches. The retina then loses it's source of blood supply and nutrition which results in a severe loss of vision. Most post vitreous detachments do not cause retinal tears. We were relieved to find out from the retina doctor, that my husband's retina had not developed any hole or tear and to call our eye doctor if sudden flashes and floaters developed again. Most ophthalmologists consider vitreous floaters harmless and there is no conventional treatment provided for them. In severe cases a vitrectomy is indicated. Many times the number of floaters will decrease or fade over time as was the case for my husband. We did seek treatment from a local acupuncturist for his eye floaters. It is hard to know if the acupuncture or just time brought about the improvement.